CUSTOM CARRY PISTOL .45, Can also be made in 9mm, 10mm, and .40 Caliber. This is our arena. We have done just about every combination possible on both the larger and smaller .45s. These smaller lighter versions may have aluminum frames with steel slides for weight savings. This one was built on the compact frame and is in .45 caliber. At the other end of the spectrum, we made carry sidearms for several hunters in Alaska as something to wear around camp because of the large predators. Most popular for hunters who like the 40 plus calibers is the magnificent 10 mm Colt. A 10 mm Colt with a long-slide could be almost called a rifle… it's really a 357 magnum with a full magazine. Slightly larger because of the comp, it has the power of a mistreated jackass, it's a fine sidearm in any arena. With the comp, it's an easy recoil shooter. I was amazed at how little muzzle rise it had shooting it on an IPSC course. We also made some for those who camp around the downtown regions of major cities for the same reasons, large two legged predators. 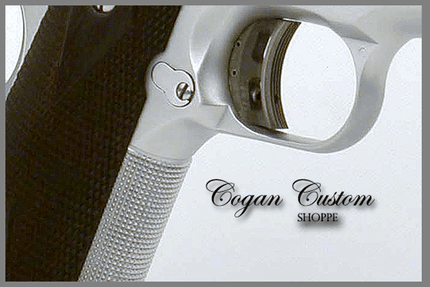 The smaller Colt frames are popular because they emulate in feel and grip many competitors competition only firearms. Many have used identical parts from their comped guns in the carry version. In a confrontation, it's no time to leatn how the gun feels. The detail shot shows the hand cut checkering, not machined, it's an old world art and the standard trigger pull and length. Most carry guns are in the 4-5 pound range, about twice as heavy as a full race gun. The theory, train for shooting and shoot with the training learned, makes sense. A phrase taken from scuba divers, plan your dive and dive your plan. The variants are endless, there are several sizes of frames, grips, barrel lengths and we have done them all. In fact, we have refinished or shall we say “finish" many new firearms and parts for many of the manufacturers. You might have one we did and not even know it. Doesn't it make sense to send us your carry gun to customize or upgrade?